In the world of online gaming there are a wide variety of quality levels for gamers. Many ‘free’ online games seem to be developed by kids with entry level skills that leave a lot to be desired. Most just aren’t that challenging, nor do they match the graphics of the top tier games like XBox 360, PlayStation3 or Nintendo’s Wii. That is until the San Francisco based Wolf Golf Tour came along. 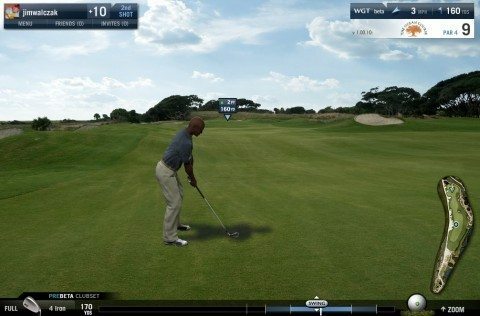 World Golf Tour offers the most realistic online golfing experience that novices (like me) and former club pros (like my buddy Mike) can appreciate. Couple that with some interactive social networking modules and you have an online game that is sure to keep your attention for a very long time. 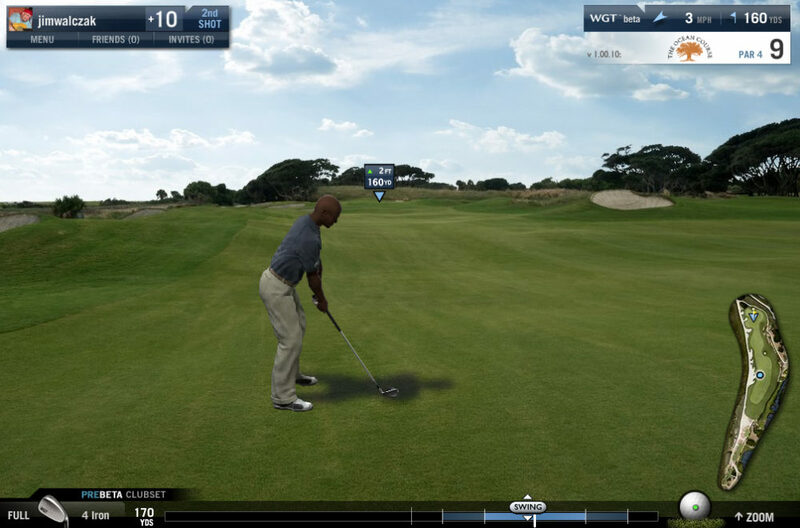 From the moment you create your profile and upload your avatar, World Golf Tour begins keeping the stats that every true golfer and online gamer would want to track. Plus, your ranking among other players is updated in real time. Presently, there are 2 golf courses that can be played. Both are pretty challenging and offer Stroke Play and Skills Challenges at Kiawah Island (South Carolina) and Bali Hai (Las Vegas). There are also free tournaments and skill challenges to test your skills — or in my case, show just how bad you rank to better golfers and gamers. The free tournaments are offering $50 to the winner. There is also a Jerry Lewis benefit tourney (entry fee $20) to help raise money for Jerry’s kids. The purse is nearly $10k and a trip for 2 with a 5-night stay, and 3 rounds of golf at Kiawah Island Ocean Course is part of the prize package. Just like other popular social networks, you can add friends. After your friend confirms, you will see a green circle next to their name in the Friends module whenever they are online and available for a multi-player game! Long Drive, Holed Approach Shot, Birdies in a Game, Successive Birdies, Hole-In-One, Double Eagles, Eagles, Hit the Pin, Long Putt Made, Hole In One Award, Accuracy Award — within 20 feet (Skill Challenge), Tournament Standing. Ever made an unbelievable shot that no one would ever believe that you hit? Well, on World Golf Tour you can save a replay to prove to your friends that you made a 41 foot putt You can even send replays to your friend’s email address. A built-in blog provides a great way to share an interesting picture or video, make announcements, or jot down your thoughts. World Golf Tour also has a forum for open discussions about the game. Don’t see your friends online? Go to their profile page and post a Wall message to suggest a virtual tee time. Overall, I found the game fun, challenging and realistic. Putting seemed a bit hard and short chip shots were almost impossible to get consistent – but then again, how is that different from my real game? Take the time to check it out and look me up (user name: jimwalczak). I’d be happy to play a virtual game of golf with you at World Golf Tour. …Now maybe I have a chance to beat my mother-in-law at a game of golf!